“I’m surprised they don’t have him walking around with a freaking cauldron of gold coins and a little green hat.” Again, laugh out loud funny. What the hell is that “P” thing on the cover? Is it supposed to be their family crest? It looks like a crappy badge. 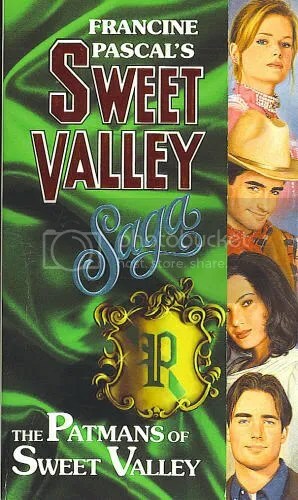 Also, that cowboy on the cover creeps me out. I’ll admit that some of the things I’ve come across have made me want to read the diaries, but as far as the Patman saga goes…your reviews will do just fine. What a bunch of assholes. Tiny speedo. If it’s Vanessa, I think what this part says about him is the fact that he got incredibly lucky in life without actually doing anything. This is Bruce’s mother’s ancestors. I’m staying tuned for the Underground Railroad. Because the SVH series has been SO enlightened on the topic of race relations. Anyway, I have been having an absolute party by myself reading them over the last week. I know you’ve pointed this out before, but 20 years later, some of the outfits they describe def. seem relevant again. All blousy softness and belts. Oh baby jesus, I cannot wait to see how the Pascal Machine handles the Underground Railroad. The Underground Railroad? really? The Underground Railroad. Huh. umm..if i met a damsel in distress in the middle of the night who happens to be gorgeous i’m most definitely taking her in! i think most single men would agree. I’m looking more in askance at the damsels who go home with strange men (and the people who write stories sending the message that this is a good idea for girls to do) than the men who take them in. That sounds like a recipe for being killed and turned into a lampshade. Okay, so I just had a horrible day at work, and I came home thinking, “please let there be a new post on The Dairi Burger,” and HERE IT WAS! A Patman post, no less! I can’t get over how much sexual assault is in these books. Methinks Francine Pascal/”Kate William” had some issues. The only saga I ever read was the twins’ mom’s side, when I was in seventh grade. Of course I lurved it. Because all of the ancestors were a perfect size six, of course! Anyway, Ihatewheat, I give thanks (a week late, but it’s the thought that counts, right?) for you and your awesome blog. Speaking of Patmans, does this book get into why Roger’s dad and Bruce’s dad had a falling out and Roger never knew he was a Patman until his mom died?!? I was never too clear on that…. Unfortunately no, but that would’ve been a very relevant thing to put in there. A lot more interesting than Henry and Marie’s drama.